At NCS, we know your time is valuable and we want to keep you informed. We’ll share industry news and updates that can help you make better business decisions about your communication, collaboration and networking infrastructure needs, by providing you with relevant and timely information. Look for press releases, details about upcoming events, and other materials that will keep you up-to-date! 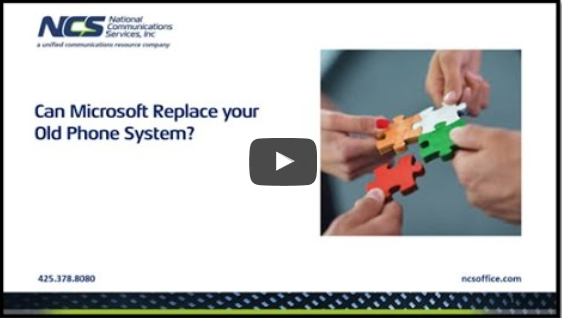 Can Microsoft Replace your Old Phone System? In this short segment, we share some important information that will help you identify the right modern communications solution for your business! Microsoft, AudioCodes and National Communications Services, Inc. hosted a live web seminar covering modern communications. This discussion of important information will help identify the right telephony solution for your business – whether your roadmap plans are all-in-the-cloud, entirely on-premise, or you choose to take a hybrid approach. 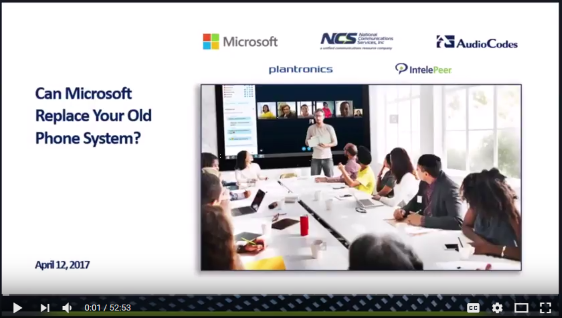 We invite you to watch the recording to learn about NCS' 90 Day Low Cost Proof of Concept offer, delivered in partnership with AudioCodes, IntelePeer and Plantronics! Please contact sales at NCS for further information! Receive the latest news and updates from NCS in our quarterly newsletter!